If you love language and how it works this is the book for you. 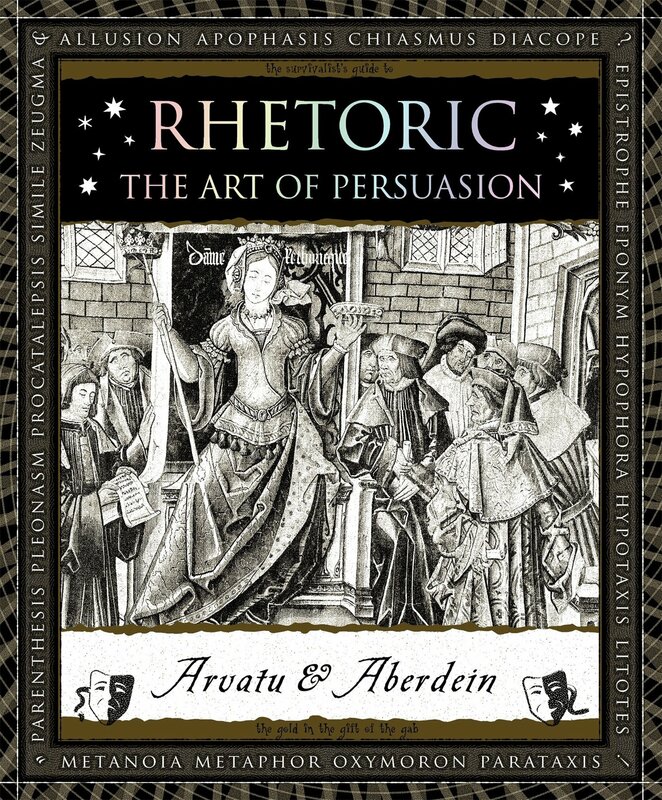 You may not become a better writer or speaker for having read it, but you will recognize and better understand rhetorical devices and how they may be used. You may even drop a term such as erotesis into conversation. That is a rhetorical question that presumes its own answer. 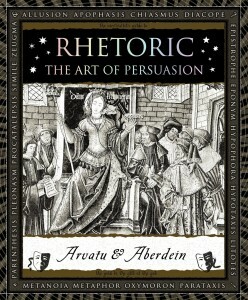 The authors of Rhetoric: The Art of Persuasion cover a host of terms from abusio through zeugma. The former, also called catachresis, is a dead or forced extravagant metaphor. The latter means using one word to govern two or more objects. Ancient and modern quotes place all the terms into context and define them. For example, Quintilian (c.35-100 AD) defined catachresis/abusio as “the practice of adapting the nearest available term to describe something for which no actual term exists.” That empty space at the blunt of a sewing needle becomes an “eye,” and a camel has a place to squeeze through. Tom Robbins wrote, “Hawaii made the mouth of her soul water.” The putative soul has no mouth so this is a prime example of an extreme or runaway metaphor, one that is too clichéd or too far-fetched to comfortably fit the idea of metaphor. Its intentional humor of such outlandish metaphors caused Stephen Colbert to call them “humaphors,” an apt description. Each term leads the reader forward or back in exploration of the richness of the English language. Simple line drawings illustrate various points. The cartoon on the title page, just under the sub-title, depicts a serpent appealing to Eve as she contemplates an apple. Will she be persuaded? My personal favorite is included: hysteron proteron. It is a term that I first came across in 1969 when I was editing publications in a joint military command headed by an air force general under army regulations governing marines and navy personnel also, a situation offering a multitude of possibilities. It is transposition by inversion, for example, putting the cart before the horse (Illustrator Merrily Harpur provides a cartoon showing exactly this. ), getting things in the wrong order. How often do you say, “I put on my shoes and socks this morning”? Think about how people might react if we put on our shoes then our socks! The reader will find new terms here and many familiar ones, but will quickly recognize that knowing the precise, technical nomenclature will not cause a sense of loss. On the whole one is likely to gain a greater appreciation for the skills used by the great orators. Arvatu and Aberdein have created a highly readable and enjoyable romp through a subject that has been an object of study since humans first took chisel to stone. Their prose is light and airy and sure to please. An appendix contains precise definitions of the various terms and a helpful pronunciation guide. Adina Arvatu is a rhetorician from Romania who now lives in Australia. Andrew Aberdein is Professor of Philosophy at Florida Institute of Technology. The present volume is among some 30 volumes in Bloomsbury’s “Wooden Books” series, covering topics including the cosmos, dowsing, Islamic design, Stonehenge, and weaving.